PETALUMA, Calif.--(BUSINESS WIRE)--HydroPoint Data Systems®, the market and technology leader in smart water management, today announced the launch of the WeatherTRAK® LC+ irrigation controller. Created specifically to meet the needs of the light commercial market, the new controller delivers the power of cloud-based smart irrigation at an affordable price. 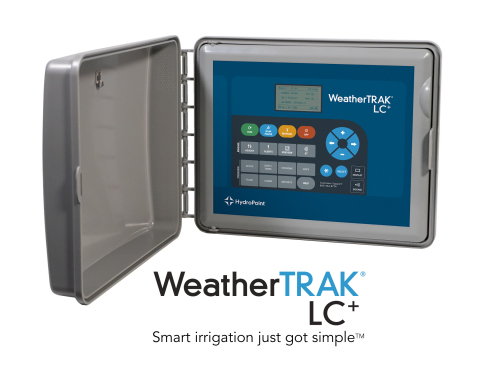 The WeatherTRAK LC+ controller features sophisticated automation technology from HydroPoint that improves efficiency, and delivers water savings by as much as 35 percent, at the most demanding sites. The controller also determines watering requirements based on local conditions, computed from a network of more than 48,000 weather stations across the U.S., to maintain plant health and provide an attractive landscape. The WeatherTRAK LC+ controller, which starts at a suggested list price of U.S. $999 for six stations, can be ordered today and will begin shipping in August. The controller includes one year of WeatherTRAK Central service and a three-year limited warranty. HydroPoint® Data Systems is the market and technology leader in smart water management. As an EPA WaterSense® Manufacturer Partner of the Year, the company offers smart irrigation solutions under the WeatherTRAK® and Baseline® brands; leak detection and flow monitoring with WaterCompass®; and portfolio-wide Performance Management services that increase visibility and control. From Lowe’s to Los Angeles County, HydroPoint has been helping commercial, government, education, and communities maximize water savings, reduce operating costs, and minimize risk since 2002. For more information, visit hydropoint.com. HydroPoint Data Systems announced the launch of a cloud-based smart irrigation controller designed and priced for the light commercial market.